The LenderCheck II is our NEW and more efficient environmental screening report that makes it easy for Lenders, Brokers, and Buyers to identify the Environmental Risk on collateral loans or property transactions by searching for any potential environmental concerns on their site and nearby sites up to 1/16th of a mile. 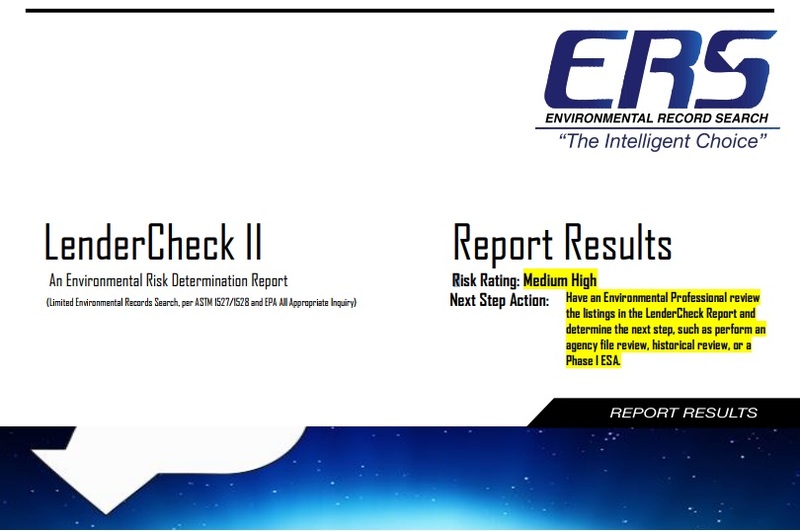 The report also includes an Environmental Risk Rating and Next Step Action directly on the cover in order to instantly know what to expect with the site. A great tool for pre-loan due diligence, semi-annual portfolio screening, pre-listing, pre-closing, loan renewal, etc! Environmental Risk based solely on your site and sites within 1/16th of a mile proximity.